Former Red Sox slugger Manny Ramirez, who has tempered his comments on Boston and the Red Sox since being traded to the Dodgers in mid-season, had plenty to say to T.J. Simers of the Los Angeles Times in a column published yesterday. Ramirez told Simers the fans in Boston supported him, but the media made his life difficult. More from Ramirez on the differences he perceives between Boston and LA. “I would bring my kids to the park [in Boston] and I want my kids to be kids, but there’d be people trying to interview them. That’s so stupid,” Ramirez said. “I’d go to the parking lot after the game and 20 people I didn’t know would be offering food, CDs and things — then wanting something in return. That suggests he wasn’t running everything out in Boston, and while he tries to explain, he’s interrupted. There’s no explanation for such behavior after signing a contract and being paid $20 million a year to give his all. We’re sure some folks who frequented Fenway Park for the last eight years would take umbrage with that last statement. 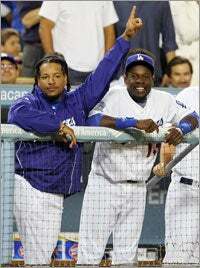 As for the incident that had him knocking down a Red Sox executive, “I was wrong,” Ramirez said. He said the relationship with the executive had been deteriorating for some time, and a day earlier the guy had said some nasty things to Ramirez in front of Ramirez’s teammates. When he didn’t get the response he liked, it escalated into a shove. “I didn’t handle it the right way,” he said.